Occurs in 23032% of knee dislocations. (Johnson ME, AJSM 2008;36:2448). Popliteal artery is tethered proximally at its origin as it emerges from the adductor hiatus and distally at the tendinous arch of the soleus. 50º hyperextension of the knee results in popliteal artery rupture (Kennedy JC, JBJS 1963;45A:889). Document posterior tibial and dorsalis pedis arteries before and after any reduction manuever. Evaluate for expanding popliteal hematoma, pulsatile hemorage, palpable thrill. ABI (arterial pressure index): determined by dividing the systolic pressure of the lower extremity (DP or PT) by the systolic pressure of an uninjured upper extremity. ABI > 0.90 indicates arterial injury. (Mills WJ, J Trauma 2004;56:1261). Arteriography: Gold standard for diagnosis. Revascularization should not be delayed to perform arteriography. Arteriography complication rate = 1.7%-3.3% (intimal dissection, bleeding, thrombosis, groin hematoma, arteriovenous fistulae, pseudoaneurysms, reactions to contrast medium, and renal failure). Vascular surgery consult and repair ASAP. Generally concomittant leg compartment fasciotomies and venous repair followed by knee spanning external fixation. 86% amputation rate if popliteal artery is not restored within 8 hours of injury. 89% salvage rate if popliteal artey is restored within 8 hours of injury (Green NE, JBJS 1977;59A:236). Posteromedial Approach, identify arterial injury. Expose and control artery above and below injury. Proximal and distal thrombectomy. Reversed saphenous vein grafting from the contralateral extremity. Intraoperative angiogriography with distal runoff views confirming patency of repair. Early systemic heparinization. Concomitant popliteal vein repair is advantages to prevent venous congestion and hematoma formation. Ballon angioplasty and percutaneous stent placement may be considered for blunt injuries (Johnson ME, AJSM 2008;36:2448). Discuss signs and symptoms of ischemia and need for immediate evaluation if any occur. Generally placed on anticoagulation post-op. 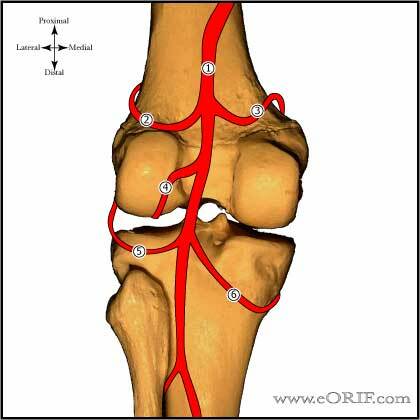 Generally require knee ligamentous repair 2-6 weeks after revascularization. Early ligamentous repair is desirable, but vascular integrity takes presidence.